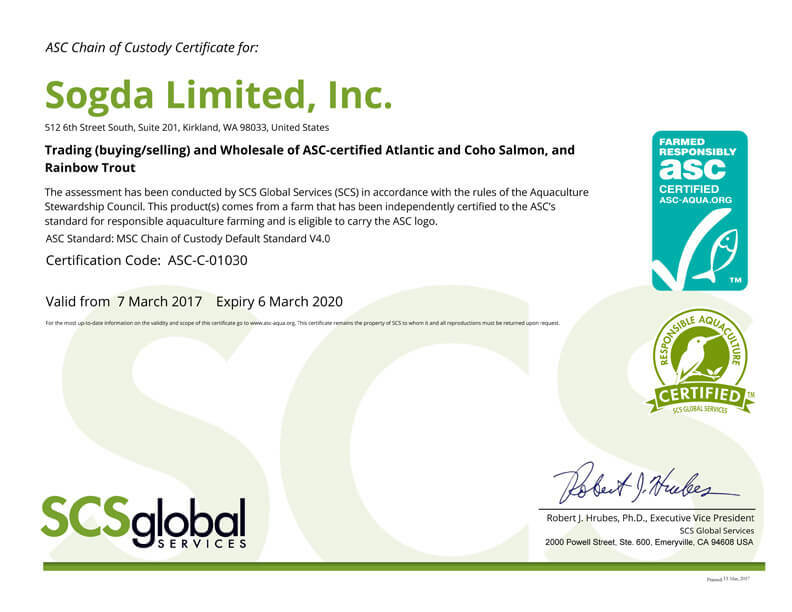 Founded in 1995, Sogda Limited, Inc. serves the global wholesale seafood market as a primary distributor of locally sourced wild seafood products. 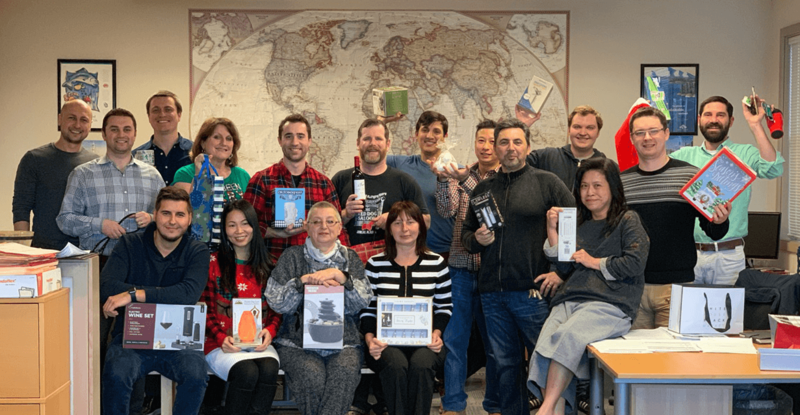 Our Kirkland, Washington headquarters office houses all major fully-operational departments, including: international sales and marketing, purchasing, logistics, quality control, accounting, and administration. Our fish is sustainably harvested from Pacific Ocean fisheries ranging from as far north as the Bering Sea in Alaska to as far south as the Sea of Cortez in Baja California, Mexico. Pacific Whiting, Pacific Cod, Alaska Pollock, and all five wild salmon species as well as salmon roe and ikura are just a taste of the products we offer. All of our products are processed and frozen either onboard catcher-freezer vessels, at-sea processors, or shore-side plants, all of which are FDA and USDC certified facilities. 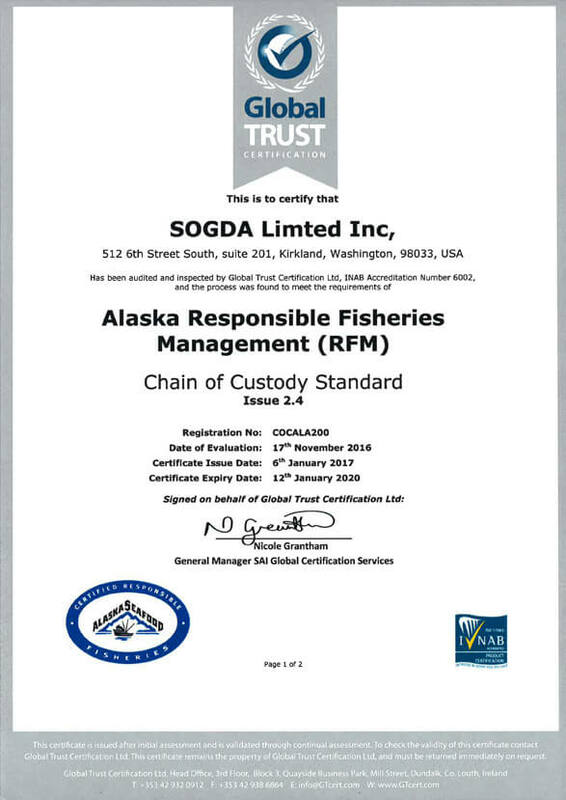 Additionally, Sogda Limited, Inc. has been certified as a sustainable supplier according to the requirements of the Marine Stewardship Council’s chain-of-custody standards, qualifying us to carry the MSC logo (registration code SF-C-1183). Sogda Limited currently distributes into more than 60 countries worldwide, with a specialization in brand management. We own and have developed several key brands in the seafood industry, the most widely recognized being Pacific Fisher, Captain’s Pride, and Ocean’s Finest. Over the last decade, these brands have quickly grown into household names. In support of our ongoing marketing efforts, we exhibit throughout the year at major seafood industry expos, including: Seafood Expo North America in Boston USA; Seafood Expo Global in Brussels, Belgium; Seafood Expo Asia in Wanchai, Hong Kong; Conxemar Exhibition in Vigo, Spain; China Fisheries and Seafood Expo in Qingdao, China; THAIFEX World of Food Expo in Bangkok, Thailand; Seafood Expo in Dubai, UAE; as well as various smaller events around the world. As our market development and distribution volume have expanded, so has our need for direct market presence. This led to our 2007 grand opening of Sogda Limited, Inc., Qingdao, our branch office in the coastal city of Qingdao, China, which has allowed us to directly serve the needs of the wholesale seafood markets throughout Asia. Qingdao is a major hub for Asia’s thriving seafood industry, and with the expertise of our local representatives, Sogda Limited, Inc., Qingdao provides a seamless and reliable channel from our headquarters in Washington to the markets in Asia. 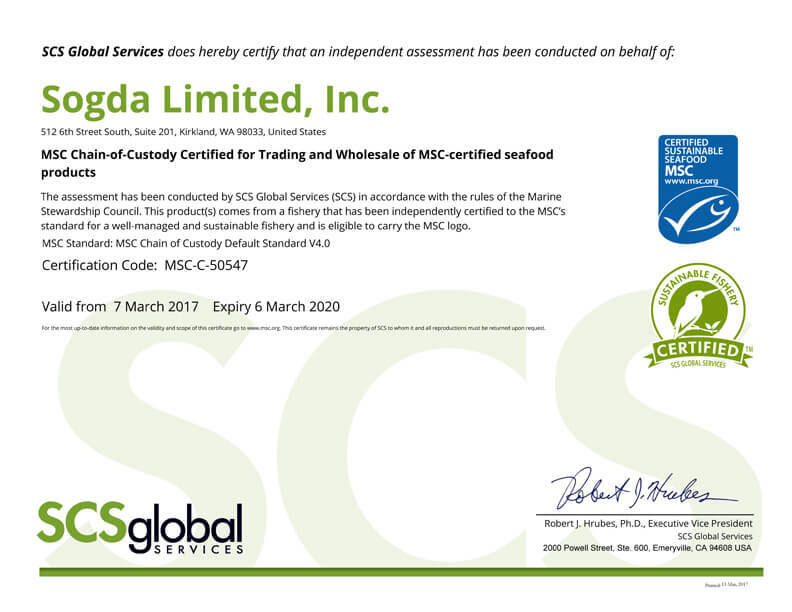 Sogda Limited, Inc. provides all necessary logistical services to ensure organized control of inventory and shipping schedules. Our fully-staffed logistics department are experienced in international shipments to all major global ports, as well as U.S. export and foreign customs import regulation compliance. All needed documentation and customs requirements are provided and part of our service. Packaging, labeling, and other specifications are customized to meet national and international requirements, as well as the specific needs of our customers.